A small island lost in the middle of the south Atlantic Ocean, St Helena was chosen by the British government as place to exile the deposed Emperor. “The island of St Helena is the ideal place to lock away such a character. In such a place, so far away, no scheming of any kind will be possible and, far from Europe, he will be quickly forgotten”. Lord Liverpool, the British Prime Minister, was greatly mistaken on saying these few words: the legend surrounding Napoleon was started in Island of St Helena, the place of his death. Napoleon arrived on board the Northumberland on October 17, 1815, and spend his first night on the island in a small inn which no longer exists. The following day, he went to Longwood House, the house in which he was supposed to settle during his captivity. At the time, it was but a small place on an arid plateau the British had planned to transform to accommodate the Emperor and those who were close to him. While these transformations were being made, Napoleon settled in the green valley of the Briars, in a house next to William Balcombe's colonial residence. In December, he moved into Longwood House where he peacefully spent the remainder of his days. With Baron Gourgaud, General Montholon, General Bertrand and both their wives, Count de Las Cases, the Irish surgeon O'Meara and a few servants by his side, Napoleon divided his day to day monotonous life between work sessions, meetings and walks under the close supervision of a British officer at all times. In 1819, urged by O'Meara to take some exercise, he had a new layout of the garden designed, thus giving the estate the beautiful appearance it has today. Napoleon died on 5 May, 1821, He was buried according to his last wishes on 9 May near a source in the Geranium Valley, called the Valley of the Tomb ever since. In 1854, Napoleon III negotiated with the British governement to buy back Longwood House and the Valley of the Tomb which became French property in 1858. Administered by the Foreign Affairs Minister, these two estates restored to their 1821 appearance are now open to the general public. Composed of a few rooms, Longwood House features a collection composed of a few remaining pieces of the house's original furniture, souvenirs of the Emperor and works of art reminiscent of his incredible destiny. 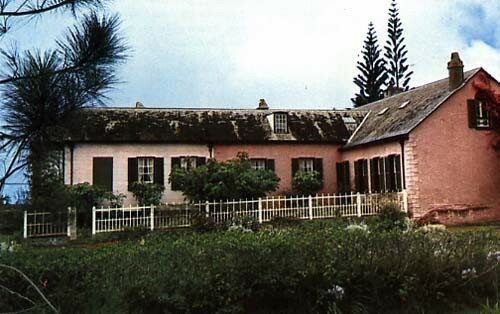 The outbuildings adjoining the house that accomodated Napoleon's companions are inhabited today by the Honorary Consul of France, curator of the French estates of Island of St Helena. A winding footpath leads the visitor to Napoleon's tomb which is surrounded by railings topped by spear-heads. The tombstone is large and white and bears no inscription. It is surrounded by several trees, among which are 12 cypress trees planted in 1840 in memory of Napoleon's twelve great victories. Donated to France in 1959 by William Balcombe's great-grandaughter, the Pavilion des Briars was redecorated using the servants' memoirs. A small museum devoted both to Island of St Helena and to the British who witnessed Napoleon's exile was built there. Longwood House and the Emperor's tomb: from Monday to Friday from 8:00 a.m. to 1:30 p.m. and from 2:00 p.m. to 4:30 p.m.; on Saturdays from 8:00 a.m. to 12. Pavillon des Briars: Tuesdays, Thursdays and Saturdays from 8:00 a.m. to 12.